Things are really heating up at the top of the table as we near the end of the League. Clonmel travelled to UL to take on Richmond on the 4G all-weather pitch. And just as well it’s an all-weather pitch as freezing temperatures and blizzards of sleet and hailstones made for a challenging day for the players and supporters alike. The dogged work of our forwards and the fleet footwork of our backs showed results when Luke Hogan got in for our first try, which Darren Cass converted. Luke Hogan then showed great strength in the tackle and superb footwork and speed to flash over for ours and his second, Darren Cass converted.It was a bruising battle for the forwards who dominated in the lineouts, and some great interplay with the forwards and backs saw Luke Hogan go in for his third try, Richmond 0 Clonmel 21 at half-time. In blizzard-like conditions our forwards continued to dominate with great lineout work and superb mauls. Darren Cass raced into the corner to make it 26-0, which was followed by a great try from hard working Andrew Daly. Another great phase of play saw Luke Hogan go over for his fourth try which Darren Cass converted. In typical Richmond style they never gave up and fought hard for every ball and were rewarded with two late tries to leave the final score Richmond 12 Clonmel 38 . With two games to go it is looking like a three-way battle for the league between Clonmel, Newcastle West and Bandon. We are away to Waterpark next Sunday with a 2.30 k-o. 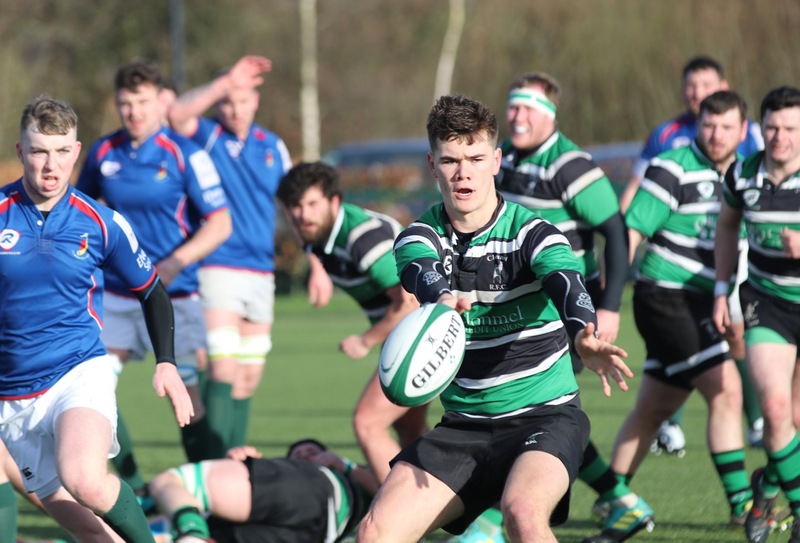 Clonmel out-half sets up his backs to run at Richmond in Sunday's Munster League game played at UL. Our U-16s made club history on Saturday when they travelled to Clonakilty in the Munster Cup to come away with a very hard-fought win against a really talented home side to top their group and secure a home quarter-final for the first time ever. This has been an outstanding season for this team and their coaches. A big shout out to the parents who have travelled the length and breadth of Munster to support this team. Well done. Our U-18s lost at home to a really good Ennis side in the U-18 Munster Cup. Our U-14s narrowly lost away to Cashel in the East Munster Cup. There was no winner of this week’s Lotto Jackpot. Numbers drawn 2,16,19,24. There were 5 match 3s. Next Draw on February 19. Jackpot is now at €16,400.